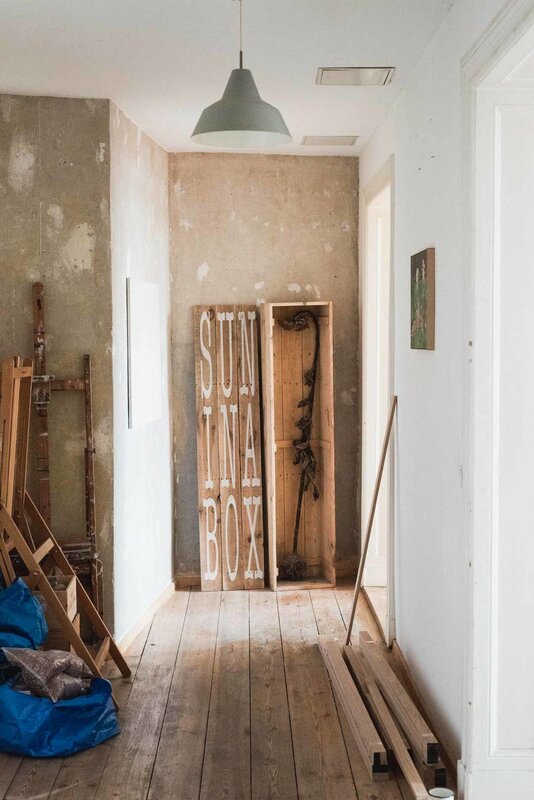 Danish artist Lars Bjerre moved to Berlin over a decade ago to pursue his art practice in a spacious, brightly-lit studio near Treptower Park. Working at the crossroads of painting and installation, Bjerre has since created a considerable collection of detailed narrative series, encompassing both large-scale painted canvases and complementary sculptural additions. The stories his works relay range from darkly humourous to intimate and nostalgic, and often include references to nature and its perpetual manipulation by mankind. 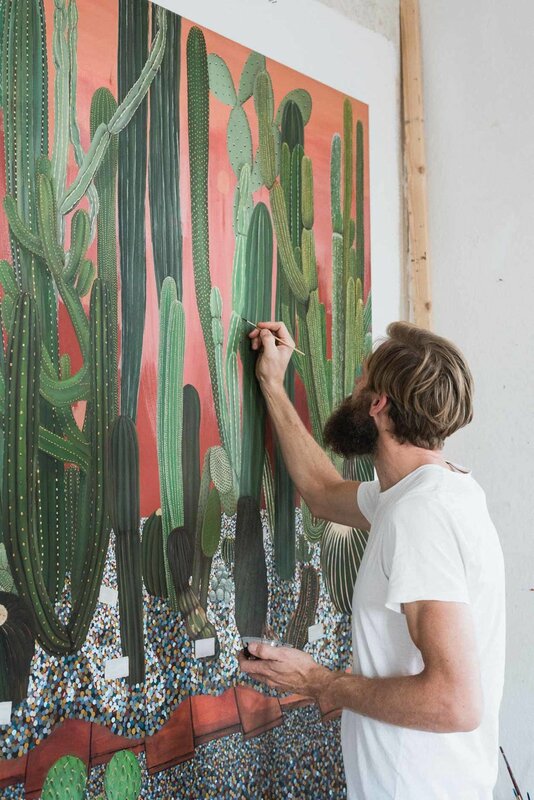 Bjerre's solo exhibition "Sun in Splendour" at SMAC draws on imagery of botanical gardens and displaced desert cacti, addressing our tendency to groom and manicure nature for our own aesthetic pleasure. The thoroughly pebbled and dried landscapes of Bjerre's latest series access this world of beautification at a disturbingly close range, providing a fresh perspective on the near-manic drive to control natural processes. SMAC: You often supplement your paintings with installations bringing to life the architecture of the spaces you portray. Why is it important to give them a tangible dimension in the space? Lars Bjerre: The beginning is always a painting and then the installation comes afterwards. For the exhibition at SMAC I did a lot of colour tests to find the right combination of dots for the pebbles, which cover most of the canvases' surfaces. I use the exact same colours in each painting, except for the different backgrounds, which give them entirely different temperatures. I chose seven colours, varying in lighter and darker versions, ending up with 22 different nuances. I usually work in series with a narrative output, but I began this one without a concrete idea. It started very simply: I was in the Botanical Garden in Copenhagen, in a space with monotone stones, and took some photos of those. I was working with motifs of plants before, so I wanted to find a way to include and arrange the stones as well. This idea is realised differently in installations and the editions I made, which include actual coloured clay pellets protruding from the work, translating or even copying the two-dimensional surfaces of the paintings into a three-dimensional reality. One of the installations in the exhibition is a horizontally-placed frame, like a table, holding real cacti and clay pellets toned in the same nuances as the paintings. Like in many other encounters between paintings and installations that I have tried to stage, I find the dialogue between those two material realities very interesting. What kind of process do you undertake in creating these works - from initial narrative exploration to final exhibition? I work on one theme, usually, and it’s like storytelling for me. I’m not a good writer but I like to tell a story. When it’s done, I move on to a new narrative or sequence. It’s usually something that’s boiling in my head for a long time. With this series, however, I wanted to make works without a narrative starting point – and that’s very new for me. Instead, the series describes a dry, monotone and almost dystopian landscape. The motif that relates to the saying "Sun in Splendour" was originally used as a heraldic charge, a representation of the sun with rays and a human, smiling face. This anthropomorphized notion of the sun was essential for picking this as the title for the exhibition. In a previous exhibition titled "I escaped when the trees started to grow" in Vrå in Denmark, I started with a place that I knew from my childhood – my grandmother's garden shed. I removed all the items from inside the shed and re-installed them in the exact same place in a reconstruction of the shed, inside the exhibition space. The whole inside of the shed, even the dust and dirt, was moved to the museum. It hadn’t been touched since I was a kid, nobody used it anymore, so it felt like a time capsule that I tried to move into the gallery space. This exhibition was about the feeling of time standing still, particularly in small, rural villages like the one where my grandmother lives. You’re also a co-founder of Point Project, a curatorial platform. How does curation inform the holistic approach of your artistic practice as well? It doesn’t really. We are three members in Point Project; I am the only artist - the other two are curators and writers. We jointly discuss a theme and each one contributes a selection of artists we’d like to collaborate with, and then decide on a concept in that way. In both cases, the curatorial work and the artistic work, exhibitions are mostly built up around the architectural space and the geographical location, since it has its own limiting and decisive factors. Spatial memory and intimate psychic processes of characters are very well detailed in your works. Where do you get inspiration for the stories you tell? I studied psychology before studying art. I don't know – maybe that's why there are always humans in my paintings. I started "Sun in Splendour" without any motifs of humans, but eventually felt like including one. For years, lots of men in suits have appeared in my paintings, because the outfit it so neutral. They could also be women. They are simply placeholders for individuals in our society. The faces in your paintings are often obscured or smeared with thick paint, giving them a haunting quality. Why? For the same reason. It’s mainly to make the people neutral, and to give me more freedom in the painting. The blurring gives a more painterly quality: it’s more about the movement and the material than the faces, for me. How did you go about choosing the materials and pattern for this series? I started this series in Spain. 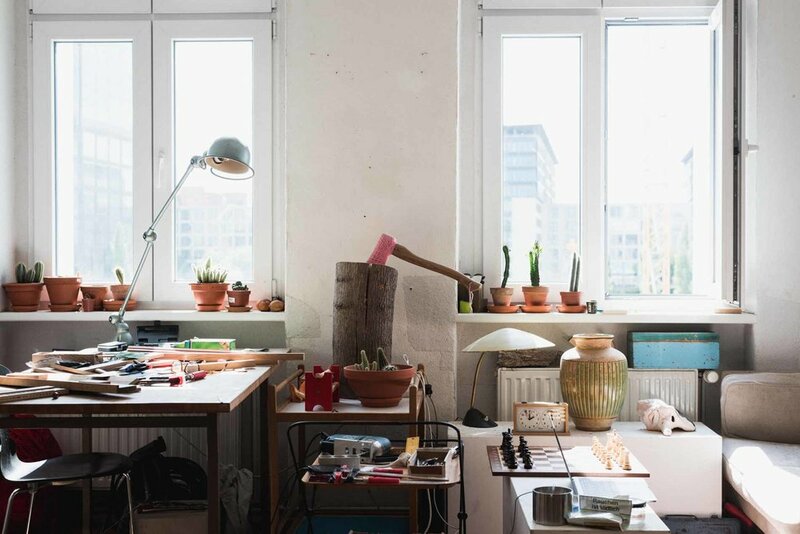 I bought a lot of small cacti there, as models, and brought them back to my studio in Berlin. The larger painting is called "He explained the cacti by the fertilizers". The reference to fertilizers is about grooming these plants in a certain way, and it also relates to how the food industry pushes in that direction: to create products for fast pleasure. I’m very interested in how humans interfere in nature and how they are manipulating it. This also influences the way we relate certain material with a notion of nature. People have always had the drive to push nature in their way. 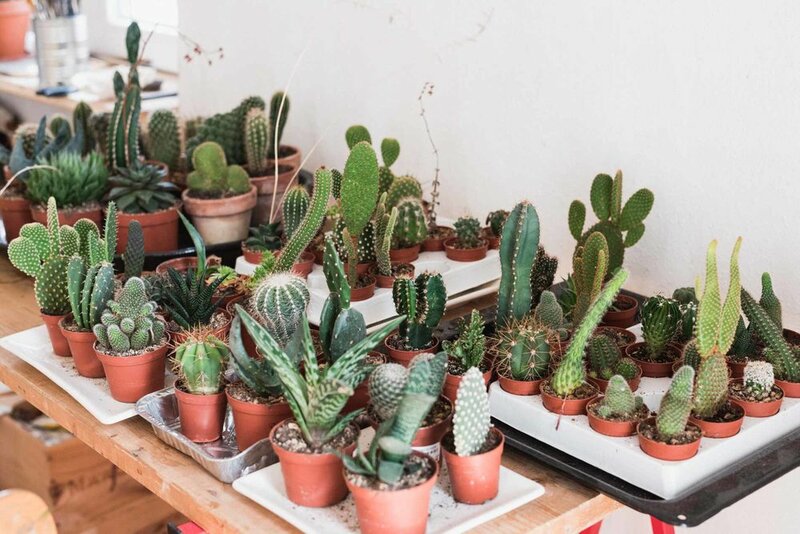 Right now, these kinds of cacti are extremely fashionable and they are reproduced everywhere. Is there a political element to this work, in how you view human interference in nature? I suppose there is always a political element in every work of art. I’m interested in the issues related to climate change as a topic, but it's not necessarily the main theme of a series or a work. In the end I always want people to interpret the work in their own way. I have an idea, but I like to leave it open ended: it’s not interesting for me to present conclusions. Nature, or whatever we consider to be nature, always returns in my work. I have, for example, worked for a long time with motifs of wood, and with its processed and non-processed material. When I made "The Lumberjack’s Hut" series, I was again interested in the human interference in natural material and resources, and how this interference defines what we consider to be wild or part of the natural environment. I found this barn with chopped, stacked wood in front of it – this image is so ambivalent to me, because it's very brutal, but also very beautiful.